One of the most important things to is that the wine-growers from Alsace have their heart set on passing down what they have received themselves as a legacy: respect for the soil, care provided to their amazing vineyards, poetry of a great wine. 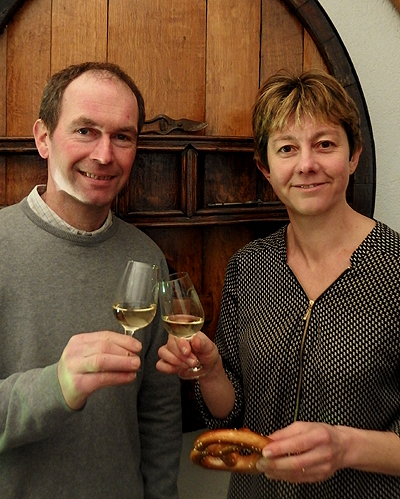 Michel Moellinger, heir to several generations of wine-growers, and his wife Isabelle run in well thought-out growing the traditional Alsatians grape varieties (Gewürztraminer, Pinot Gris, Riesling, Muscat, Pinot noir, Pinot blanc, Sylvaner) on the hillside of Wettolsheim. Located in the wine-growing region between Colmar and Eguisheim, the domain gets no less than 3 Grand Cru soils: The Hengst, the Steingrubler and the Pfersigberg. In the wine cellar, the wood of ancients casks neighbours the high tech brightness of the stainless steel vats. A little bit further away, in close formation in a compartment, upside down, Crémant bottles await for the disgorging process. 2 Moellinger Riesling wines have been awarded a gold medal at "Riesling du Monde 2017" : our Riesling 2015 Grand Cru Steingrubler and our Riesling 2015 Grand Cru Pfersigberg.